It’s 2018. There is a strong chance that you or someone you know has written a blog post at one point or another. The world of blogging has existed since the late 1990s, though the blogging craze began around the mid-to-late 2000s. Businesses and individuals alike jumped on the blog bandwagon as a way to promote themselves. As with any marketing strategy, some found success, some did not. Today the Internet is so oversaturated with blog posts that many marketers ask the question: Are blogs still valuable for content marketing? Blogging may be less popular than it once was due to the uprise in social media and visual content, but it can still be a powerful marketing strategy. You just need to create the right types of posts. The main reason most of us use the Internet is to find answers to our questions. Whether you’re looking up a recipe, watching a YouTube tutorial, or typing our medical symptoms into the search bar, you’d be hard-pressed to find someone who doesn’t use Google to answer questions. When you type in “how-to” on YouTube, there are 622,000,000 results. Millions of people are searching for answers every single day. It’s been found that 94% of blog readers share blog posts because they think they could be helpful for other people on their social channels. This is why instructional, or “how-to”, blog posts are key to any good blog. It allows you to be the authority on a given topic by offering step-by-step advice and answering readers’ questions. The above post about contouring (a popular beauty trend over the last five years) from the popular beauty blog, Huda Beauty, is a great example of a how-to post. There is a solid paragraph about the content of the tutorial and below is a link to the YouTube tutorial. This blends a traditional blog with video content, which most of today’s Internet users prefer over traditional written content. Not every single viewer will know that Huda Kattan is a makeup artist, beauty blogger, and entrepreneur. However, through these tutorials, she establishes her expertise in the beauty realm. No matter what your business, a well-crafted tutorial post solidifies your credibility on a given topic. This can lead a potential customer to trust you for products or services. There was a time when marketing was all about selling a product. In 2018, most audiences don’t respond to this type of content. People want real, human stories, not something faceless and corporate. We want to make purchases and decisions fueled by emotions, not sales tactics and soulless facts. When you know and respect the ethos of a company, chances are you’re more likely to choose that business for its products or services. A study by BuzzSumo found that blog titles with emotional hooks attract more shares, likes, and comments than posts without emotionally charged words. An interview piece or spotlight is a great way to create this type of emotional content. Getting someone’s true thoughts and feelings out there can make for excellent emotionally-driven content. 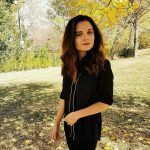 Above is a blog post for one of our clients at Oozle Media, Elevate Salon Institute (ESI), Chubbuck. For this post, the client was interviewed via phone call about a recent inter-school cosmetology competition. This interview was extremely valuable when it came to creating the blog post, as it allowed us to get a real sense of the event and literally hear the client’s voice. Through the interview, we found out that the proceeds of this contest were donated to a cause close to the client’s heart. This emotional drive created a compelling story that was worth sharing with the hopes that it would win the hearts of potential students. 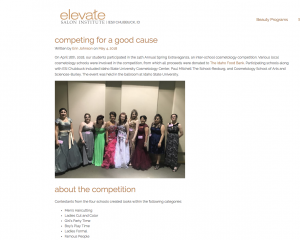 The title “Competing for a Good Cause” appeals to the reader’s emotion by instantly informing them that is a blog about a charitable action. Who wouldn’t want to attend a school that values compassion and service? If you’ve ever read an article on BuzzFeed or Refinery29, chances are it was a listicle. These blogs are fun, snappy, visually appealing, and easily shareable on social media. A listicle takes a topic and breaks it down into a concise, readable list. The list size is up to the author, but numbers like five and 10 are the most common. Listicles are a great way to share a message quickly. When broken up with pictures or GIFs they’re even more appealing to readers because there aren’t large blocks of text to digest. Studies have shown that the human brain responds positively to lists because they provide structure and eliminate anxiety. While a listicle is different from a to-do list or a shopping list, it’s written in the same organized, number-ordered format. In 2017, a blogging study done by marketing research and education company, ConversionXL, found that 36% percent of blog readers prefer a numbered list headline while only 15% prefer a standard blog headline. Here are just four examples out of BuzzFeed’s extensive beauty listicle library. Each title is catchy and includes a number. These invite the readers to click on them (AKA clickbait). Another important note is the listicles’ featured images. They’re colorful, aesthetically pleasing, and convey exactly the topic of the listicle. BuzzFeed’s listicles are so popular that the news website Medium created a separate listicle all about BuzzFeed’s top 25 listicles. 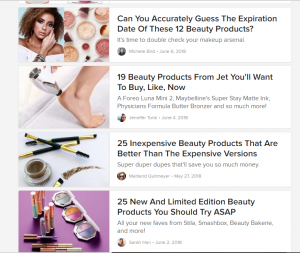 Listicles are made for social media sharing, so it’s important that they are immediately eye-catching when a reader scrolls through Facebook, Twitter, or Instagram. If you want to add simple yet creative content to your blog feed, throw in a listicle every now and then. 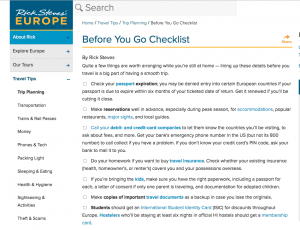 Similar to the how-to type of blog post, a checklist helps readers solve a problem. Providing a step-by-step guide is helpful to an audience. 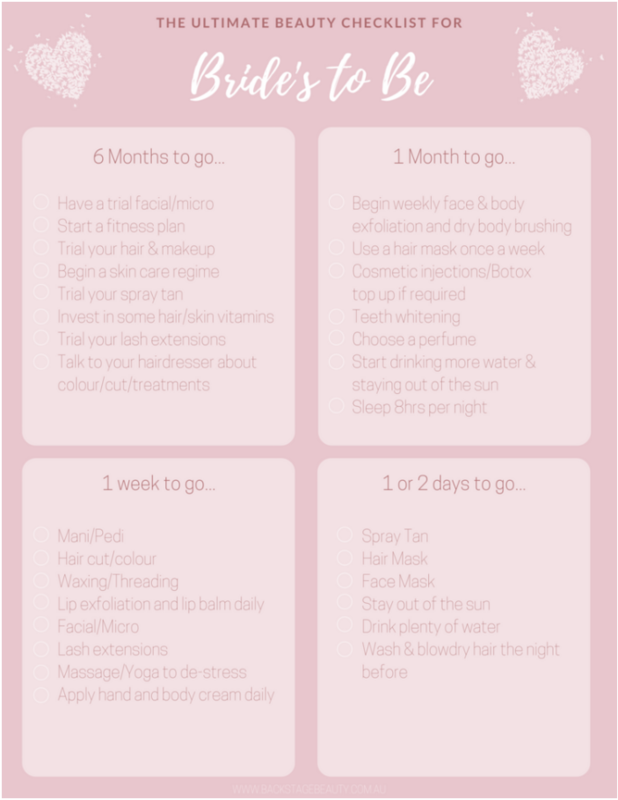 Whether it’s a college prep checklist, a packing list, or a step-by-step beauty routine, checklists break down information and offer organized solutions. The efficacy of the checklist goes back to the research about lists. Our brains are programmed to use lists as a way to spatially process information. You’ve probably heard a lot of statistics about how short our attention spans have become. A checklist blog can hold the average online reader’s attention because it’s short, sweet, and easy to scan for vital information. 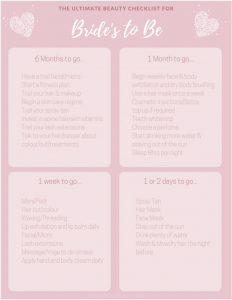 This bridal checklist from Backstage Beauty is a great example of a standard blog post turned into an eye-catching visual piece. Brides get stressed about their weddings because there is so much to do. A checklist like this does a great job of offering segmented, easy-to-read information that is specifically written for the targeted audience. Here’s an example of a checklist blog post that is strictly text-based. While we know people love visual elements, sometimes you just need direct information. 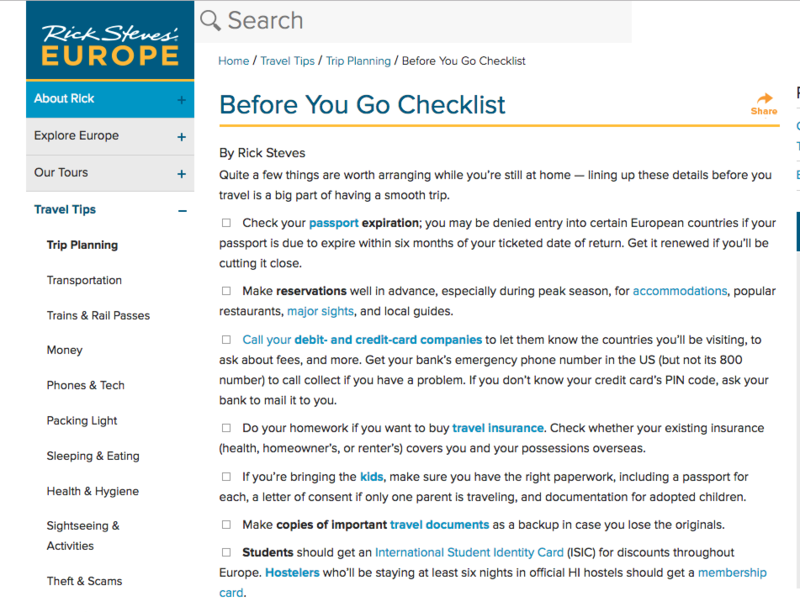 This Europe travel checklist from Rick Steves provides thorough information to prepare travelers for their journey. Going to a new country is a big deal and people want to be fully prepared. This straightforward checklist is designed to do exactly that. A good blog needs a mix of posts that are creative, helpful, and informational. According to a study by BuzzSumo and Mantis Research, nine out of 10 companies found that doing original research to create data-driven content can successfully combine these three adjectives. In 2016, Blogging.org found that 6.7 million people worldwide are using blogging sites. Doing unique original research will help your business stand out amongst steep competition because the data was curated by your company. Creating a data-driven blog post can support your sales pitch and improve the website’s click-through-rate. It will also make your website the main resource for that specific information. Common types of research-based content include surveys, statistics, analysis, and experiments. The social media management company Buffer did a study of their blog traffic in July 2013. Traffic had increased by 59% in just one month. Three top-performing blogs were analyzed and two of those were research-based. One focused on science and the other on statistics. Simply writing a good story is powerful. However, when you have statistical evidence to back-up your writing, it makes your post even more effective. Thorough research has been done in various academic journals arguing that statistics are more persuasive than just using words to tell a story. Just because a post is research-based doesn’t mean the topic has to be dull! 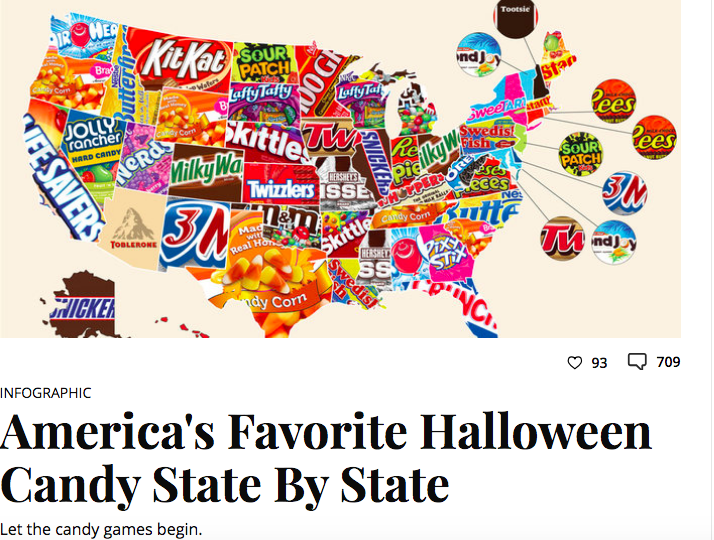 The Halloween candy example above came from a survey of 40,000 people at the Influenster Headquarters. It’s data-driven while also being a fun, colorful, seasonal post that readers will want to look at. 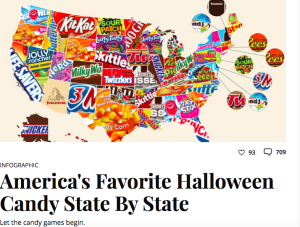 Beneath the map the author included a clear breakdown of each state with the name of the favorite candy. Though it’s not high-brow, intellectual research, it’s a great example of how much fun you can have with data-driven blog posts. 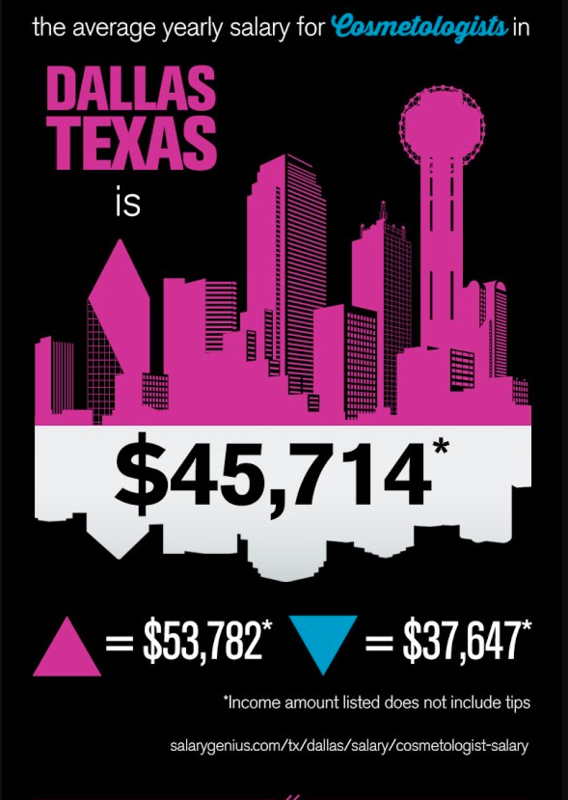 This image Oozle Media created for The Salon Professional Academy (TSPA), Dallas is a great example of data-driven content as an infographic. It includes helpful statistics about careers in cosmetology laid out in an attractive, easy-to-read fashion. 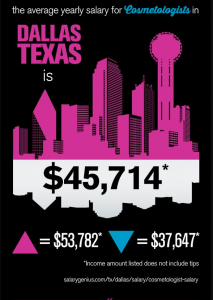 Statistics like these are useful for any reader considering a future in cosmetology. While research-based blogs may seem less imaginative, the original data they present to a reader is useful. If your data-driven blog post is reliable, current, and easy to read, you’re offering potential customers a high-quality solution or answer. It may seem daunting to create blog posts in a world where there so many of them. Don’t let this discourage you! 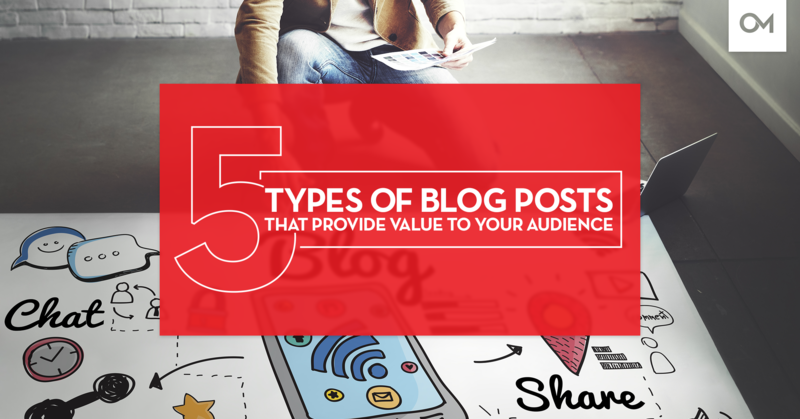 When you create the right types of blog posts, you’re offering answers, information, and value to readers. Blogs are a great way to market your business without being too formal or “salesy”. People who come across your blog are searching for information, advice, entertainment, and solutions to problems. Include these five posts on your blog and you could become a reputable resource that readers will want to return to.